As the 52 Super Series heads to the high summer, happy hunting ground that is the Bay of Palma out from Puerto Portals, Azzurra lead the circuit after four of this season’s six regattas by one single point. Harm Müller-Spreer’s Platoon are breathing down their backs and the Quantum Racing team are poised just six points off the lead. To date, this has been the most competitive 52 Super Series season yet. 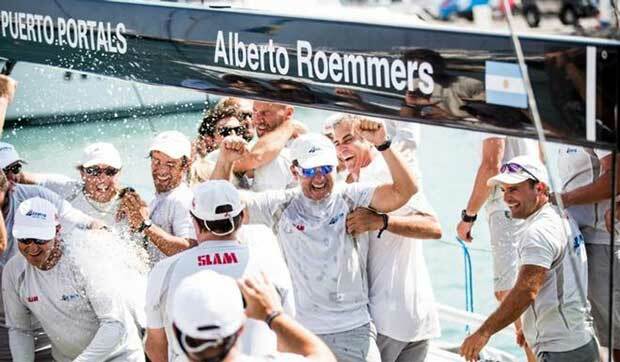 Four different teams have each won a regatta; Quantum Racing in Key West, Azzurra in Miami, Platoon at the Rolex TP52 World Championship in Scarlino and Niklas Zennström’s Rán Racing in Porto Cervo. Interestingly, the winners of both the 2015, and the 2016 52 Super Series seasons – two years in which the 52 Super Series has been hosted by the chic, showcase Puerto Portals Marina – have both won comfortably on the Bay of Palma, building a cushion that has served them well in their respective overall title victories. Last year, Quantum Racing won by 12 clear points in Portals, their biggest margin of the season, and went on to win the 52 Super Series championship. In 2015, Azzurra won Puerto Portals by 14 points, their biggest margin of the season, and won the 52 Super Series. After next week’s Mallorcan regatta, the 52 Super Series’ finale is in Menorca this September. It is hard to see the Puerto Portals 52 Super Series Sailing Week – which starts on Monday – being won by such a margin this year. Six of the nine teams competing have all finished on the podium this season. Eight of the nine teams have won races in Puerto Portals since the fleet returned in 2015. Quantum Racing, Bronenosec and Platoon have all won four races apiece, platoon taking three. Azzurra feel especially comfortable on the Bay of Palma. They are without the added weight of expectation felt when racing at their home club, the Yacht Club Costa Smeralda. But skipper Guillermo Parada acknowledges that although they come to Puerto Portals with the smallest of leads, they need to sail much better and cleaner than they did last month in Porto Cervo when they finished fourth, even if they were just five points off winning. Terry Hutchinson is still hurting after the Quantum Racing crew missed out on victory in Porto Cervo due to a broken forestay strop in the last race. Anyone who has watched the 52 Super Series over its five-year history knows that when Quantum Racing get up off the canvas they are often at their most potent. Strategist Bora Gulari is absent this week, doing what he does best at the International Moth World Championship in Italy. Michele Ivaldi steps back into the crew line up he served well before as navigator. 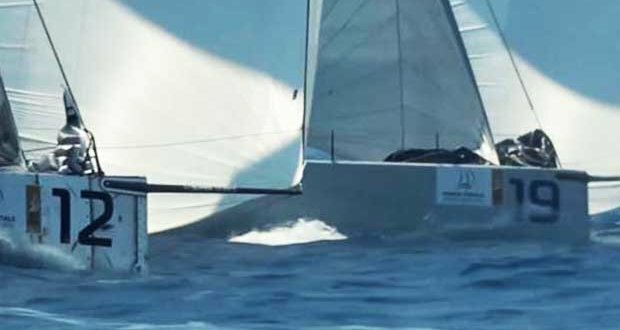 Andy Soriano’s Alegre team are back, ready to race after they broke their mast in Porto Cervo. They stepped their previous mast a few days ago and have been working to get the rig fully tuned. Neither was luck was on the side of Ergin Imre’s crew in Sardinia. Handed a chance to win the regatta outright at the top mark of the last race, they suffered a failure of one shackle at just the wrong moment and could not sheet down their gennaker. Navigator Nacho Postigo, “The Wizard of Palma Bay” remains philosophical as the team seek their first regatta win together. The official practice race is on Sunday 23rd July. Cyclone forces Volvo Race leg 5 delay Fear or respect?